No matter if the job is commercial, industrial, or part of an HOA project, you have the option to use a low VOC paint. With the knowledge that has been gathered over the years about how harmful certain paints and additives can be to people and the environment, it is great to know that paint manufacturers have taken the time and effort to create some great alternatives. You might wonder what the difference is between these two levels of volatile organic compounds, as both sound like they would be great to use. But there are little differences. Whenever someone is referring to low VOC, the levels range between 5 to 49 g/L. When they are talking about zero VOC, the levels span between zero to 5 g/L. As you can see, there still can be some levels of volatile organic compounds within the zero marked brands. It should be pointed out that even when you buy or use paint that is low to no VOC’s, there still can be additives (mostly tint) that can raise the rating to a much higher level. Make sure if you are planning on buying the paint yourself that you find coatings that have natural pigments instead of those that could be more toxic. Many coating manufacturers have worked hard at trying to get the levels as close to zero as possible, and are continuously looking for ways to improve all of their products. Dry Time – Most of the low to zero VOC coatings are quick to dry. This also can help get the job done with minimal interruptions. Environment – Low to no VOC paints are better for the environment. The more we do our part in lowering emissions the better. When using these paints, we are cutting down on the gasses that can harm the ozone layer. It is a win-win situation. Health Benefits – With low to no ratings, you can rest easy in the fact that you and those around you will not be hurt from harmful fumes. Not only does this help at the time of application, but it also ensures that it will not have any harmful effects after the paint has dried. Odor – Reduced odor is important for when you are working around areas where people will still be present. Within hospitals or medical facilities, schools, or offices, these coatings are ideal. Since there is little to no smell, you are able to paint while others are present, cutting the downtime for the business you are working in. Resiliency – Since these paints and coatings have been refined from the time that they were first created, they are now very dependable and tough. Spreads Well – Low to zero VOC coatings provide excellent spreadability and are easy to work with in all different situations. There are many other benefits to using low to zero VOC paints, which your local commercial or industrial painter knows well. 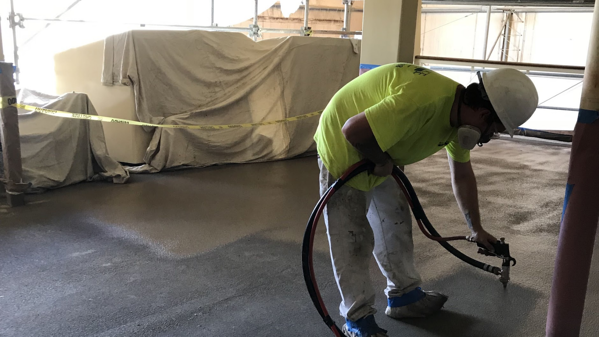 If you have a HOA, commercial, or industrial project coming up, it's wise to consider these coatings for the safety of your crew. Do not hesitate to call in the experts. They will be able to guide you through the choices that may be available to you, and let you know exactly how much and how long it would take to complete for you. Our planet's health and the health of our workers should be paramount to us. Supporting and using low to no VOC coatings is just one step we can take to make a difference in our world. Not only do these paints help preserve the planet that we live on, but manufacturers have been working hard to make them just as strong, if not stronger, than their predecessors.